Scuba diving is a form of therapy for our Heroes suffering from post-traumatic stress disorder (PTSD). Diving With Heroes, a non-profit group, is dedicated to making sure that the freedom and wonder of scuba diving is available to or Heroes of war. The BBC documents how scuba diving is helping British Soldiers deal with PTDS in the clip below. A documentary film called “Sixty Feet of Freedom” was produced with Freedom Media and Snappa Films. This film uses the experience of 3 injured veterans to illustrate the mission and purpose of the Diving With Heroes organization. The Diving With Heroes organization offers three programs that help provide opportunities for our heroes to experience diving. These programs include local diving, domestic diving and international excursions to the Caribbean. Diving with Heroes is a tax-exempt 501(c)3 nonprofit organization that accepts donations in order to continue their services. Click here to help our heroes experience the freedom and wonder of the diving experience. 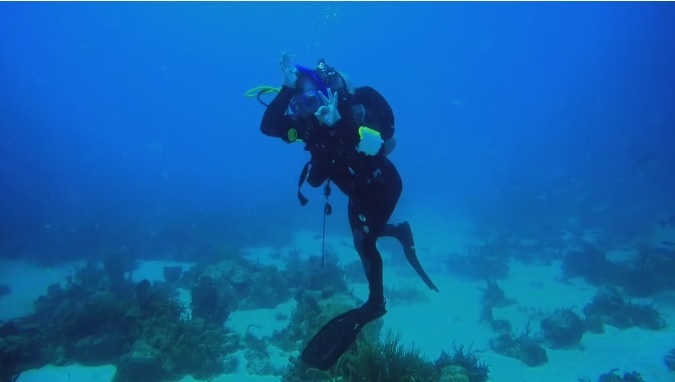 Read more about diving and PTSD here in this NYTimes aritcle. So true! I have PTSD and man does it help!